Over the past ten days, British ultra–endurance cyclist Josh Ibbett has covered 4,239 kilometres, travelled through 10 countries and tackled Mont Ventoux in France, the Strada dell’Assietta in Italy and the 25 switchbacks to Mount Lovcen National Park in Montenegro. Why did he do it? It was all part of the third edition of the Transcontinental Race. The rules of the Transcontinental state that each competitor must complete the distance alone and unsupported – that means no team cars, no help with repairs and nobody to take a share of the work when there’s a brutal headwind. In short you have to be completely nails to finish the thing, never mind win it. But win it Josh did, in a stunning time of 9 days, 23 hours and 54 minutes – that means he averaged more than 400km per day. Ibbett finished second to Kristof Allegaert in last year’s edition, so he had plenty to prove this time around, but also plenty of experience to draw on. His victory was largely down to his savvy racing skill and a small dash of good fortune, with several of his close competitors faring worse than he – with a host of punctures, minor traffic accidents and injuries befalling many of the participants. 175 people started the race, as yet none but Josh has finished. There have been many withdrawals – as is to be expected with such an attritional contest. To be honest, just completing is a monumental achievement worthy of a lot of respect. Riders in the Transcontinental – which is supported by Brooks England, one of our favourite bike brands – have to make their own way between a set of checkpoints that are scattered roughly along the way to the finishing point – but there are no hard and fast rules about the route each rider must take. This year competitors had to travel from the finish to checkpoint one atop Mont Ventoux in the south of France. Next they headed east to Sestriere in northern Italy, before striking out again for the Hotel Lav in the town of Vukovar, Croatia. After that it was the mere matter of popping down to Montenegro to a fourth control point, then through Albania and Macedonia, into Bulgaria and all the way across to the Turkish border. 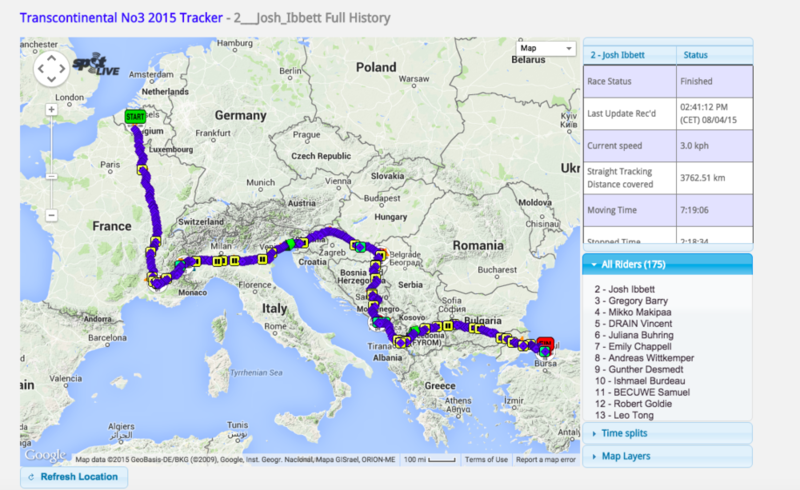 150 more kilometres and Josh reached Istanbul. Josh Ibbett’s epic route in full. You can read more about the Transcontinental on the official website. Or follow them on Instagram. Cover image property of the Transcontinental.